We value being part of our local communities. Invision was honored as the recent recipient of the City of Salem “Green Award” for a beautification and landscape project. The public voted Invision 1st place for “best bedside manner” in the New River Valley by readers of “Our Health” magazine. Roanoker Magazine readers voted us “Best of” for Optical shops. We thank all the people who voted and who are our champions within our community and beyond. We say it all the time–and mean it each time we say it–we truly have the best patients. Over the decades we have been in business, it has been our joy to quietly provide complimentary eye care and glasses for local school children. We help kids in Salem, Roanoke and the New River Valley through our trusted network of friends, teachers, school nurses, principals and administrators. Dr. Jon Gudeman has provided vision care on many mission trips to Sudan, Congo, India, Kashmir, and Yemen. His son, Josh, served with him on a Philippines mission trip. 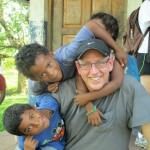 Dr’s Becky & Scott and their family have participated on several medical mission trips; they have a heart for an orphanage in Puerto Cabezas, Nicaragua, which is partnered with OrphanNetwork. Dr. Scott and his son, Michael, have made 2 similar trips to Cartagena, Colombia. Michael speaks español much better than his dad, which is a great deal of help on these trips. Medical, dental and eye care teams have also served displaced refugees. Click the countries to see our facebook images for these trips. We realize there is much that can be done close to home in addition to abroad. For us, we believe it is an honor and a privilege to serve the local and global community with optometry.